Success in life is never an individual accomplishment—it is always a culmination of those who inspire you to chase your dreams, encourage you along the long road of achievement, and who impart the necessary knowledge. There are also those who give you the physical tools, who grant you the opportunity, and last but not least those who work along side you every day in pursuit of mutual goals. What started in the 4th grade with a little orange ball, a lot of height, a tad bit of coordination, and a huge dream of playing in the Olympics has transpired to an amazing journey from Macy, Indiana to some of the greatest stages professional basketball has to offer. While I have cherished every moment of preparation and competition that this game I love has allotted me, my life as a professional athlete has always been about something greater than the sport itself—it is the bond that I built with my teammates, the experiences of living in foreign countries, and the platform to make a meaningful contribution to this World. As I think back over all my years playing basketball, I see the faces of my teammates, hear the voices of my coaches (some louder than others), feel the love and encouragement of my family, friends and fans, and I am consumed with gratitude. 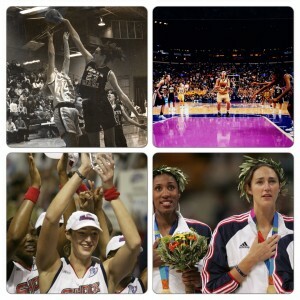 Reflecting over my career, my mind wonders back to the summer of 1997, I was sitting in my living room in our little farmhouse outside of Macy, IN, watching the inaugural game of the WNBA. About to head off to Notre Dame for my freshman season, my class was unique in the sense that we were the first class to enter college knowing there was the opportunity to play in the WNBA after we graduated. If I had to come up with one word to describe my entire career, it would be “blessed.” On that initial trip from South Bend to South Beach, there was no way I could have scripted how the next 13 years would unfold. It is impossible for me to thank everyone personally, but I will do my best to try. There is a sisterhood that is organically created when you go through the grind of a professional season. It is this unique intersection of collective expectations and goals, met by the constant preparation and competition, all lived out through this inevitable rollercoaster of successes and failures. To all my teammates here in the WNBA and around the world, I am so grateful for the opportunity to not only battle along side of you on the court, but to also share this season of life with you. I recognize that I was never the most athletic player on the floor, so I relied on my work ethic, skill development and understanding of the game—and for that I want to say thank you to all the coaches who helped shape and influence my growth as a player! One of the first things people notice when attending a WNBA game, besides the incredible talent of our players, is how unbelievably passionate our fans are! Whether you have cheered for me or against me over the years, I applaud your dedication to our sport! From my high school days, to Notre Dame, to every team I have played for in the WNBA–I have received such amazing support from men, women and families, and for that I am truly grateful. Lastly, I want to thank those who have been supporting me the longest, and that is my family! While my brother has been my sounding board and my toughest 1 on 1 competition and my sister has been my constant source of support and encouragement, it has been my mom who has impacted my career the most. At a young age, she deposited within me the ability to dream big, and her unwavering belief gave me the confidence to focus on my vision. Through tremendous personal sacrifices, she always found a way to give me the necessary provision to chase after my dreams, and each and every day she modeled the level of work ethic that would eventually be the leading characteristic of my success. More than the championships and the accolades I have received over the years, I hope that my career helped impact the sustainability and growth of our league as the 1st Vice-president of our players union. I hope that my support, friendship and mentorship have been an encouragement to the players I have played with, and last but not least, I hope that every city in which I have played knew that I truly cared about not just our fans, but the community as a whole. Retirement just does not seem to be the appropriate word to use at the age of 34, because I am not getting out of the game, just changing my association to it. I am excited to take on a new role as a NBA/WNBA Cares Ambassador, continuing to globally utilize the platform of our sport to address important social issues. For the first time since elementary school, I will be a student and not a student-athlete. I am looking forward to heading back to grad school at Notre Dame, where I will be starting their Executive MBA program this fall! This entry was written by RuthRiley, posted on June 18, 2014 at 7:56 pm, and filed under Uncategorized.